WHEN YOU’RE A CHILD AND YOU DREAM OF BEING A FOOTBALLER, you dream of playing in games like the one Marseille and Paris Saint-Germain played out on Easter Sunday, 2015. Going into the 31st week of the Ligue 1 season, PSG sat at the summit of the table, one point ahead of second-placed Lyon and two ahead of Marseille in third. The game at the Vélodrome, Marseille’s home stadium, was consequently a decisive showdown between two of the main contenders for the title – especially after Lyon were unable to leave their own week 31 game with more than a draw. These are the games that matter; the ones in huge stadiums with capacity crowds and everyone’s eyes on the players, in which a title is at stake and success and glory are only 90 minutes away. What you don’t dream of, though, is the nervousness. You dream of leading your team to victory. You dream of scoring a goal in the last minute that decides the match. You dream of being a hero. You don’t dream of standing in the tunnel for minutes that are as short as they are endless, with your stomach in a knot for the duration, as fear takes over and you dread that a little more than 90 minutes later the work of a whole season will be rendered meaningless by the success of your opponent. You don’t dream any of this, but those were the emotions captured by the TV cameras as they lingered on the faces of the Marseille starting line-up. In the stands, a group of Marseille fans held a banner with a message for their club’s coach, Argentina-born Marcelo Bielsa. It read “Bielsa no se va” (“Bielsa don’t go”) in Bielsa’s native tongue, not in French – in response to the rumours circulating that the Argentine might leave town after the season. Bielsa was reportedly angry with the club’s transfer policy, having been granted none of the players he asked for when he joined the club, and being forced to make do without Morgan Amalfitano, a player Marseille sold but Bielsa wanted to keep. Luis Fernández, a former PSG coach who is said to have been instrumental in Marseille hiring Bielsa, said that the South American felt he’d been wronged, that Marseille made a commitment to him only to fall short on what had been promised. Most football coaches have complained about something like this at some point in their careers. Every one of them would have liked to buy a player their club wasn’t able to sign, or keep another player the club felt the need to let go. But to Bielsa, having the players he needs is even more fundamental than it is to most other coaches, largely because of the peculiarities of the particular system he deploys. Either Bielsa has the right kind of players at his disposal, or things will fall apart. 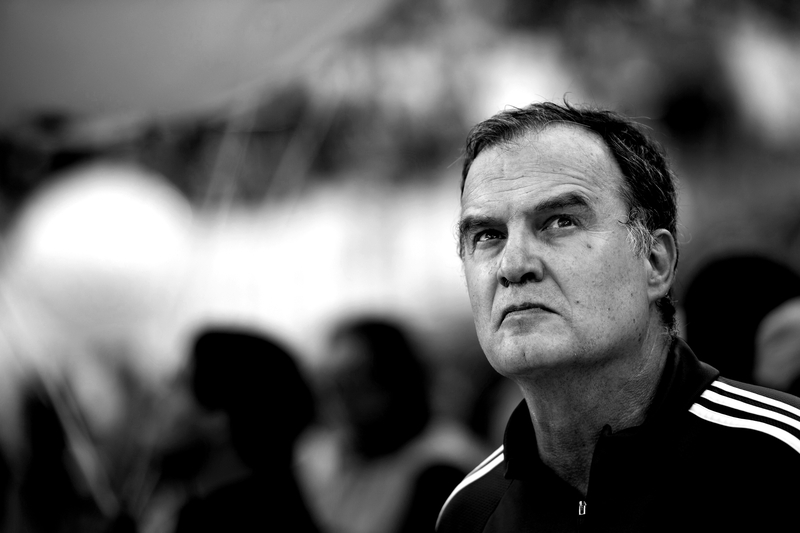 “IF FOOTBALL WERE PLAYED BY ROBOTS,” Bielsa is supposed to have said, “I would win everything.” From his early days at Newell’s Old Boys to his times in Bilbao – by way of the Argentina and Chile national teams – Bielsa has always believed in the superiority of his favoured playing system, based on winning the ball high up the pitch, on intense pressing in the opponent’s defensive midfield area, and on quick transitions from his own defence to his offensive players, while being able to retain possession of the ball when those quick transitions are rendered impossible by the opponent’s defensive organisation. While the two or three central defenders and the holding midfielder stay back to cover the defensive half, every other player – including the full-backs – “surge forward whenever possible” to make the number of players a Bielsa coached team gets “into the final third frightening at times” according to Cox. Pep Guardiola, who mastered the tiki-taka style that Barcelona and the Spanish national team used to dominate everyone they faced for six years, once called Bielsa “the best coach there is in the world”, and the similarities between the two systems are aplenty. In the ninth issue of The Blizzard, the Financial Times’ Simon Kuper wrote a brilliant piece on Guardiola and the golden rules of his system. Like Bielsa, Guardiola’s system is predicated on what Kuper calls “pressure on the ball … the instant they lose possession”. According to Kuper: “That is the perfect time to press because the opposing player who has just won the ball is vulnerable for he has had to take his eyes off the game to make his tackle or interception and he has expanded energy … he is unsighted and probably tired.” And if the area of the field where the play is taking place is in the opponent’s defensive midfield, the tiki-taka team can instantly win it back again, then the way to goal is often clear. The difference between Bielsa and Guardiola is that the latter employs a zone-based style of defence while the former prefers to use a full-on, man-based relentless pressing effort that is equally responsible for both the success of his teams and their less fortunate outcomes. Although it creates an almost insurmountable deluge of pressure on the opponent, Marseille’s system was not unbreakable; if an opposing player happened to steer clear from the man marking him, he would likely have a huge space ahead of him. PSG would find this out – and take advantage of it – winning the game and cementing their lead on the way to the Ligue 1 title. PLATO IS SELDOM BROUGHT INTO FOOTBALL CONVERSATIONS – the Sócrates most people have in mind while discussing football is not Plato’s mentor but the Brazilian superstar of the 1980s – but perhaps that is a football’s loss. His book Republic is a dialogue between several characters asking themselves the questions, “What is justice?” and “What is a just man?” Polemarchus, Thrasymachus, Glaucon, Cephalus and Adeimantus have many conflicting opinions on what is the nature of justice, and Socrates offers them an alternative answer. He claims justice’s nature is hard to discern and so decides to demonstrate what it is by looking at the polis – the city, the political community – before trying to look at it in the human soul. The city – life within a political community – arises from human need: each human being – just or unjust – needs things that by themselves they would not be able to obtain and secure, and as such need other human beings. To satisfy those needs, Plato, through the speech of Socrates, claims it is necessary that each human being does what each and every other human being needs him or her to do, and that everyone does what each is able to do best. Each man and woman must only do what is proper to them – what they are meant to do. The just city is that in which the rulers make just laws, and the just laws are those that ensure everyone does as they are meant. And just like the just city is that in which everyone does what they are supposed to do, so the just man is he whose constituents of the soul are properly ordered and adequately perform the job nature as ascribed to them. Just like the city is made of ‘money makers’ (whose soul is governed by desire), ‘guardians’ (governed by wrath) and ‘rulers’ (governed by reason), so is the soul constituted by three different parts: desire, wrath and reason. According to Socrates, the just man is the temperate man, the man who knows how to make sure that both desire and wrath are governed by reason and do not rise against it. Thus, Socrates arrived to the conclusion that the just man is often the philosopher, the man who loves knowledge and is governed by reason. And because the just city is that in which the rulers make just laws, the rulers must be the philosophers, for they alone are able to discern what “justice” really is. This is what Plato meant to illustrate with his famous Cave allegory. Imprisoned in a cave, men can only see the outside world through the shadows the fire in the cave produces on the wall; reality comes to them only in distorted images of what is actually real. The philosopher is the man who was able to escape the cave, the man who saw reality as it is, who sees the form of things and as such has the duty to show others what that is. 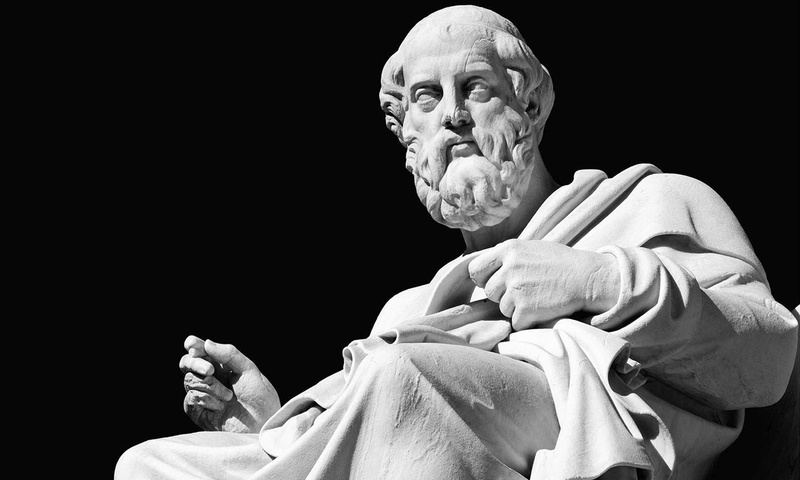 What Plato argued is that although we may not know what “justice” is, we know there is something called justice whose nature might be found through reasoning and discussion. If Plato was to coach a football team he would surely argue that there must be one way of playing, one system, that must be better than all others. 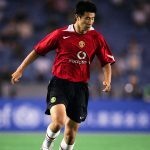 He would surely stand alongside Bielsa, against Wilson and Brown, arguing fervently that if they could choose players at will, and could be sure that they would execute every action with perfection, never making a mistake and following their instructions to the letter, they would be unbeatable. That “if football were played by robots” and all human limitations dispensed with, they “would win everything”. WE MAY NOT KNOW what the form of football is, but there are things we do know. In the burgeoning field of football analytics, writers like Chris Anderson, Mike Goodman and Michael Caley have shown that crossing balls through the air into the box is a very ineffective goalscoring strategy. If you have players that are good at creating chances both close and central to the goal, your likelihood of scoring and winning will be higher. If your players are good at creating chances for their teammates to shoot with their feet, you’ll also have a higher probability of becoming successful. It is customary to say that a coach should use his players in a way that suits them, in such a way that allows them to do what they do well. Such logic would state that if a coach’s best players are ones who can cross the ball and head it into the net, then they won’t score many. What players do best might not be good enough, if what they do best is not the best thing to win games. If we know this, if we know that some shots – depending on their location, type of pass and part of the body with which the shot is taken – are more likely to result in a goal than others, we also know that a team that can maximise their own number of most effective shots and minimise the number of times the opposing team has a chance to take those types of shots will win. And more importantly, we know that the way of playing football that maximises the number of effective shots taken by a team and minimises it for its opponents is definitely the best way of playing the game. We may not know what that way of playing is, but we know that whatever it is, it will be the best. BETWEEN 2008 AND 2012 tiki-taka seemed to be – at least among the available alternatives – the closest any team had managed to get to the form of football. But after a stunning 5–1 defeat against Holland in their opening game of the 2014 World Cup, followed by a less surprising 2–0 one against Chile, Spain had been left without a chance to amass the requisite number of points in order to dislodge one of those two teams from the top of the group and qualify for the knockout stage. Spain had dominated the football world for the last six years, winning the Euros in 2008 and 2012 and the World Cup in 2010, but was now left with a game against Australia that would grant them nothing but the dubious honour of trying to avoid being left at the bottom of their group. After the loss against Chile, tiki-taka was pronounced dead, and plenty of obituaries were written. The reports of its death, however, might have been slightly exaggerated. In his analysis of the Spain-Chile game, Pedro Henriques, a former Portuguese player turned TV football commentator, noted how Spain’s defeat was rooted in their inability to get enough people close to the opponent’s area and, without the carrousel of interchanging positions characteristic of their system, how Spanish players were unable to find enough passing lanes to retain possession. Without retaining possession they weren’t able to advance their full-backs, and without them, they didn’t have enough people to press high up in the opponent’s field. Furthermore, without that high pressing, they were unable to recover the ball away from their own goal; and without being able to recover the ball away from their own goal, Spain risked having the former get into the latter. This was not the defeat of tiki-taka. It was a failure to put tiki-taka into effect. Despite Bielsa’s most ardent desires, football is not played by robots. It is played by humans. And humans have good days and bad days. They get tired. They get old. And sometimes, this means that they become unable to do what the system they are a part of requires of them. There’s no way to know if Pep Guardiola’s Barcelona or the Spanish teams at the height of their powers would lose to the Holland or Real Madrid teams of 2014. Even if we had a time machine that allowed us to arrange a game between them, we cannot be sure whether the outcome would be affected by a player’s off day undermining the whole team and ruining the best laid plans of the coach. We may have opinions on which is the best way of playing the game, but we can never say what that is. Plato would have told us that if we’d asked him. He knew it would be hard to reach an agreement on the answer to the question “what is justice?” He may have agreed with Socrates’ answer, but he would also say that we must question his reasoning in order to see if it is correct, thereby immediately raising the possibility that it might not be so, that there might be another, more accurate answer. Knowledge can only be obtained through reasoning, he would claim, not authority – not even his. And even though the philosopher may be sure of his answers, just like the man who escaped the cave is sure that he has seen the light, it is perfectly reasonable to expect that those who have not reached his conclusion – just like those who never left the cave thus remaining in the dark – may doubt him. And who can blame them, if all they see are shadows on a wall. That, I guess, is the nature of knowledge and of human discussion on any subject: the ones who see things in the cave and the ones who see things out of it. Bielsa, too, although considered by some the best coach in the world, is to others the one they call El Loco (Mad Man). WHEN MARSEILLE LOST the 2015-16 season opening game against Caen, Bielsa finally did what – back when they faced PSG – the Vélodrome had asked him not to: he resigned, prompted by his dissatisfaction with having lost a number of key players and not being presented with suitable replacements. Bielsa thought he could not win with the men he had, and so he left. We don’t know if Bielsa is right when he says: “If football were played by robots I would win everything.” The loss to Caen shows that on that day, Caen’s players were better than Marseille at scoring goals and preventing the opponent from scoring more. But we do know that if the game was indeed played by robots, we would have an answer. We know that because football is played by humans, we can’t ever know for sure whether a system’s success, or lack of it, is a product of human error. But that does not mean that there is no best way of playing. If there are things that we know are better – types of shots, types of passes, places in the field of play from where to shoot – than others, there must be a way of playing that way, by allowing a team to do more of those things and preventing the opponents from doing it themselves. If the game was indeed played by robots as Bielsa wishes, we would know what that is. Because the game is played by men and women, with all their flaws, we too are left with no definitive answer to the question of what is the right way of playing football. Not because there is no answer, but because when it comes to finding it out, we humans – even the best among us – are far from reliable instruments to such an end.